India’s long history is filled with stories of extravagant Maharajas, Kings, and Nizams. 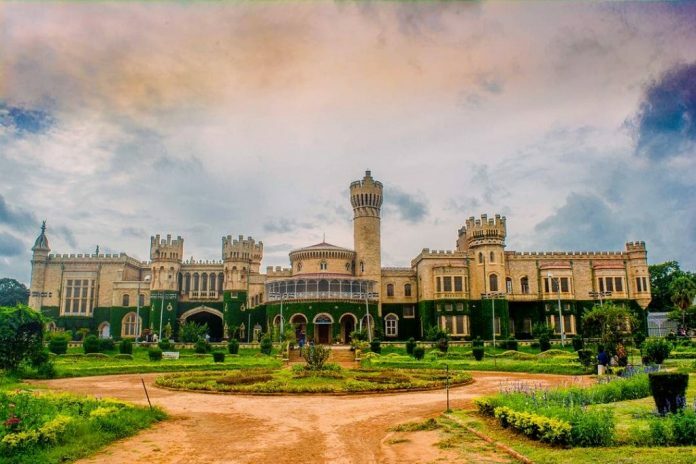 While they are perhaps best known for their imposing forts (such as Rajasthan’s Amber Fort, Delhi’s Red Fort and Hyderabad’s Golconda Fort), this rich and glorious past has also left behind many stunning royal palaces in India. Though many have now been converted into hotels, you can see what remains of opulent and luxurious lifestyle of these royals. 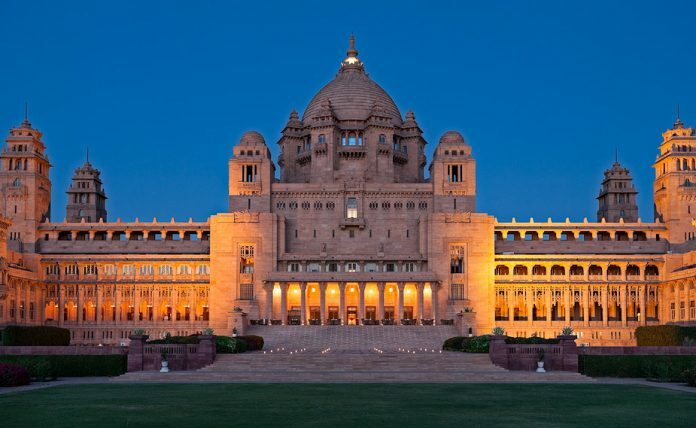 Perched atop Chittar hill over the blue city of Jodhpur is the Umaid Bhawan Palace. Completed in 1943 and covering 26 acres, it is known for its stunning mixture of Indo-Saracenic, Western Art Deco and Classical Revival styles of architecture. 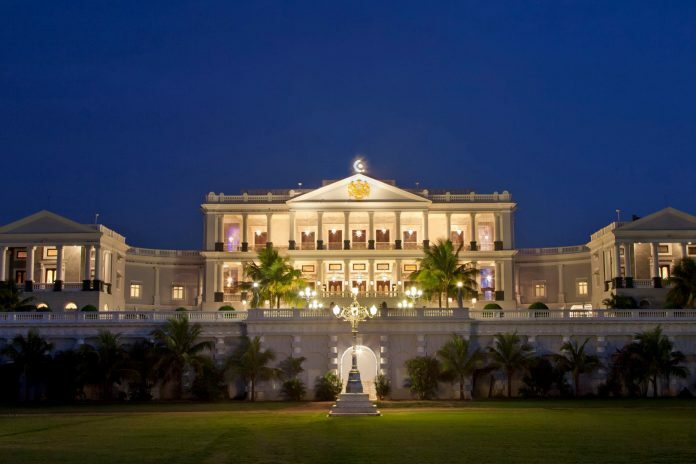 Owned by Maharaja Gaj Singh, it is one of the largest private residences in the world. Its 347 rooms feature all kinds of exhibits, including stuffed leopards, classic cars, and clocks. A part of the palace is also a heritage hotel. 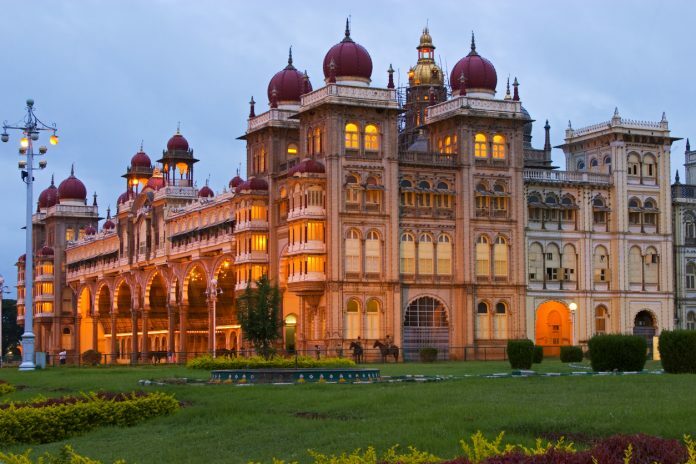 Located in the heart of the city, the magnificent Mysore Palace is truly wonderful. Also known as the Ambavilas Palace, it was designed by Henry Irving and completed in 1912. Built in the Indo-Saracenic style, its distinctive domes and turrets and full of amazing works of art from different corners of the world. The three-storey palace also has several courtyards, two durbar halls, twelve Hindu temples, and even an antique dolls pavilion. Built across 40 acres, this 18th-century palace is a mix of Mughal to Persian designs. It is split into two courtyards and is known for its exquisite antique furniture, Belgian-crystal chandeliers, and many royal artefacts including a 1911 yellow Rolls Royce. It was once the official residence of the Nizams of the Asaf Jahi dynasty and hosted many grand celebrations. This imposing royal palace was built int he 1830s by British architect Duncan Macleod for Nawab Nazim Humayun Jah of Bengal. Also called the Nizamat Kila, it is part of a large complex east bank of the Bhagirathi River that also houses the Nizamat Imambara (a congregation hall) and the Wasif Manzil. The palace is now a museum with 20 galleries displaying all kinds of weaponry, paintings, furniture, statues, manuscripts, and more. Don’t miss the massive crystal chandelier in the Durbar Hall which is said to have been given to the Nawab by Queen Victoria. At the very heart of the old city of Jaipur lies the magnificent City Palace. This sprawling complex of courtyards and gardens features a mix of Rajasthani and Mughal styles and was built by the Rajput king Maharaja Sawai Jai Singh in 1732. Don’t miss the Mubarak Mahal, the Armoury, Chandra Mahal, and the Diwan-i-Am, the uniquely designed peacock gateways, and the museums and galleries. 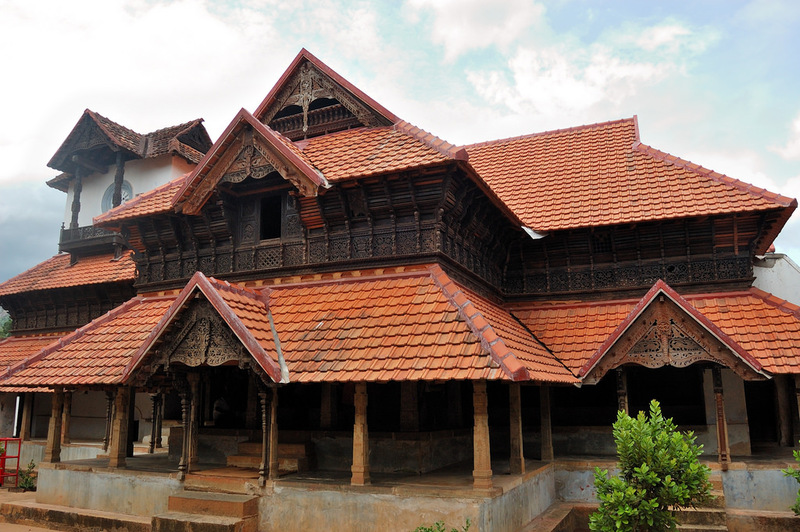 Near the city of Thiruvananthapuram lies Padmanabhapuram, the former capital city of the Kingdom of Travancore. 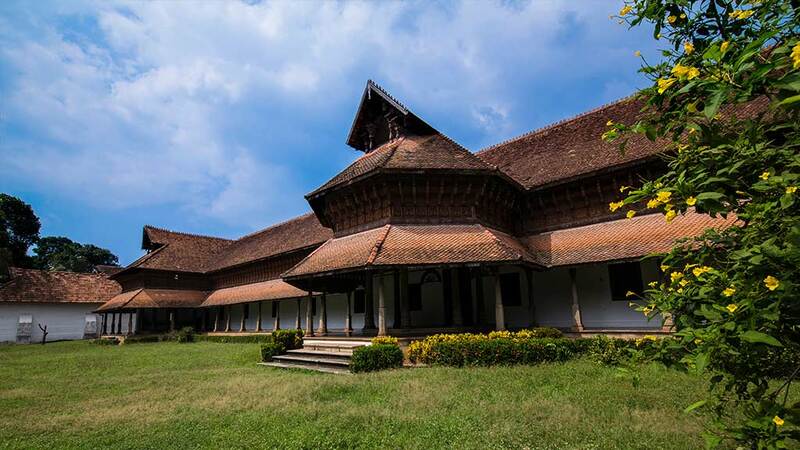 The Padmanabhapuram Palace (also known as Kalkulam Palace) dates back to the 17th century and is known for its wonderful murals and floral carvings and sculpted interiors. Explore the many rooms of the palace and their black granite floors. 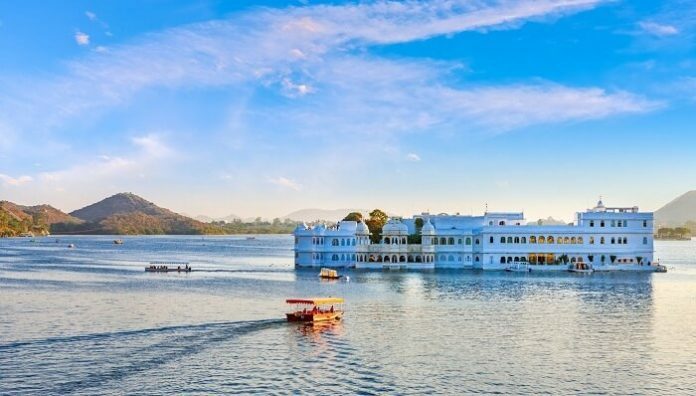 Built in the 18th century, Udaipur’s famous Lake Palace (previously known as Jag Niwas) is located on the scenic Lake Pichola. 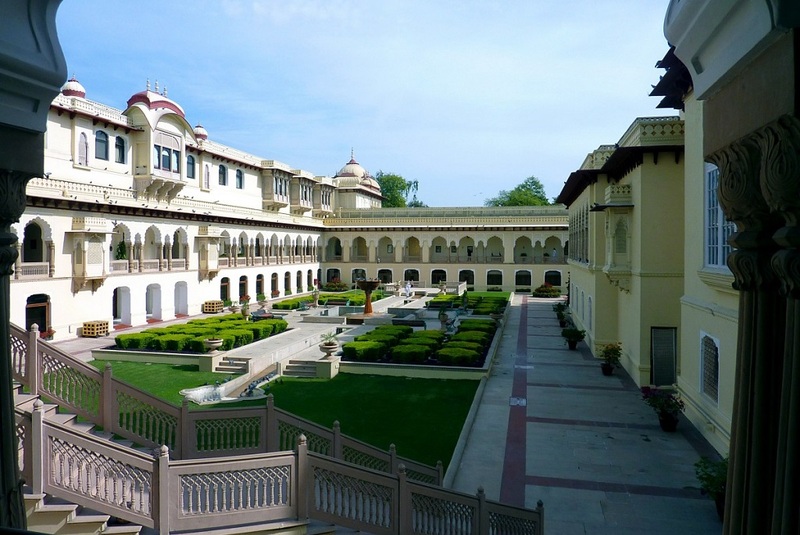 Once the summer palace of the royals of Mewar, it is now a popular Hotel run by the Taj Group. The luxurious white marble building spans 4 acres and has 83 rooms, each of which is beautifully adorned. The walls themselves are decorated with semi-precious stones and ornamented niches, and enclose all kinds of courtyards, terraces, and gardens. Don’t miss the nearby Jag Mandir (also called the “Lake Garden Palace”). 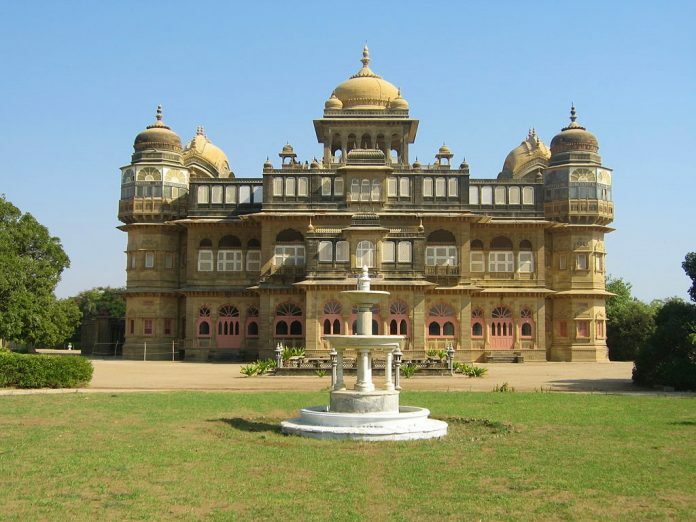 The magnificent Jai Vilas Mahal was built in the 19th century for the Maharaja of Gwalior, Jayajirao Scindia. Featuring the best of European architecture, the three-storey palace features many lavish decorations, such as gold furnishings and exquisite chandeliers. The palace is now a museum, with exhibits focused of old weaponry, historic documents, and other artefacts. The Falaknuma Palace (or the Taj Falaknuma Palace as it is now known) is a large and magnificent palace near Charminar. 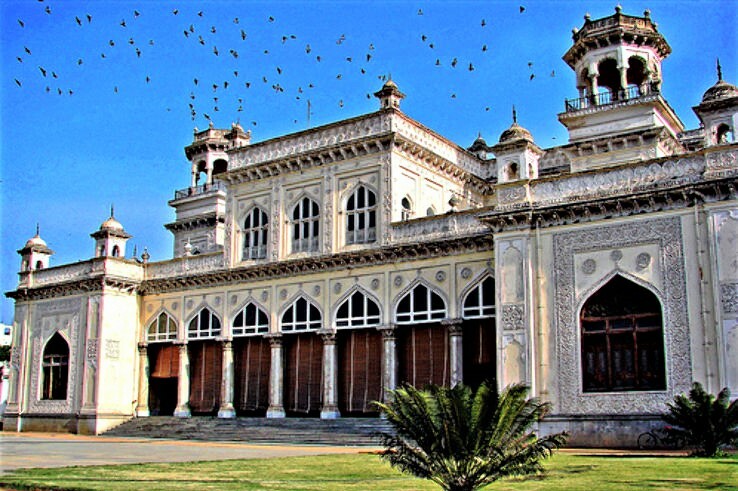 It was built by Sir Viqar-ul-Umra and later belonged to the Paigah family and the Nizams. The palace is known for its interiors, which are full of Venetian chandeliers, Roman pillars, intricate statues and art, and exquisite period furnishings. Covering 32 acres, the palace and its grounds are also home to Japanese, Mughal and Rajasthani gardens. It is now a hotel and is open to the public. Inspired by Windsor Castle, the splendid Bangalore Palace was built in 1878 as the private residence of the Wodeyars, the maharajas of the state of Mysore. 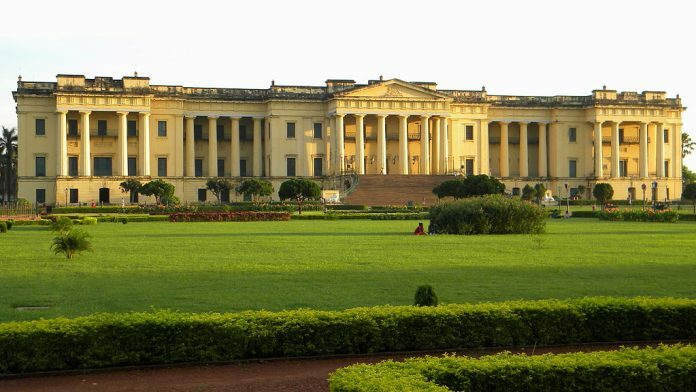 The palace features beautiful carvings both inside and outside, as well as paintings by the famous Raja Ravi Varma. You can explore the lavish furniture and hunting memorabilia, and even get an audio guide. Built in the 1920s, this stunning palace was built by Maharao Shri Khengarji III of Kutch as a summer retreat for his son. It is known for its use of red sandstone, and the exquisite coloured glass windows and carved stone screens that adorn it. There are also wonderful gardens, a museum, and even a private beach. After the Gujarat earthquakes in 2001 damaged the other palace of the royal family of Kutch, it has also become their primary residence. 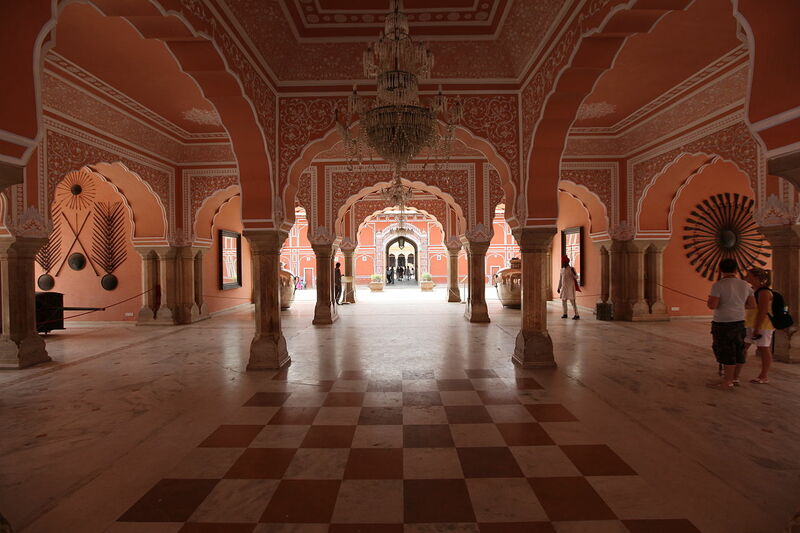 The palace has also been used in many Bollywood films, most famously in Hum Dil De Chuke Sanam and Lagaan. Located near the Padmanabhaswamy temple in Thiruvananthapuram is the Kuthiramalika Palace. 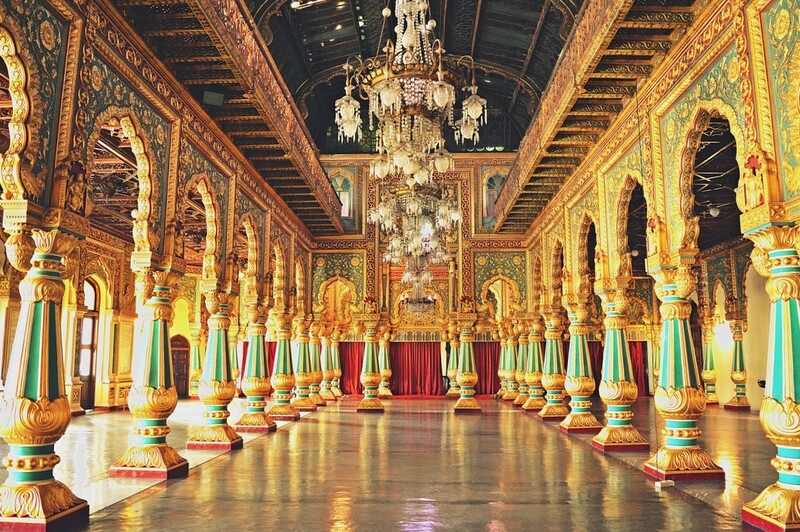 It was built by Swathi Thirunal Rama Varma, the ruler of the Kingdom of Travancore, in the 19th century. It is known for its traditional Kerala architecture (with sloping roofs and enclosed courtyards) and for the horses carved into the wooden brackets. The palace is part of a vast complex of royal buildings but was mostly abandoned after the death of Swathi Thirunal in 1846. Now restored, it is a museum filled with furniture, statues, paintings, and other artefacts of the Travancore Royal Family. 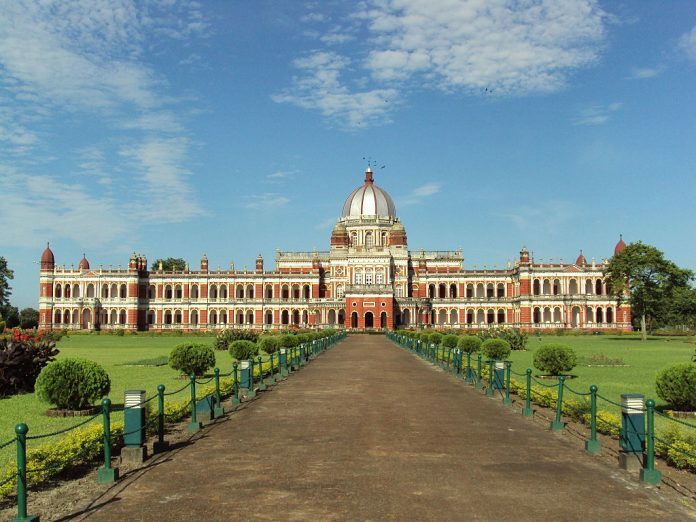 This grand and elegant palace was built in the 1880s for the Maharajas of the princely state of Cooch Behar. It is modelled after the Buckingham Palace in London, and its many halls and rooms are filled with wonderful chandeliers, paintings and photographs. A section of the palace is now a museum. Once a royal hunting lodge of the Maharaja of Jaipur, the 19th century Rambagh Palace was greatly expanded in the 1930s by Maharajah Sawai Man Singh II. It is full of opulent rooms, lush gardens, and marbled corridors. The palace is now a popular hotel managed by the Taj Group. 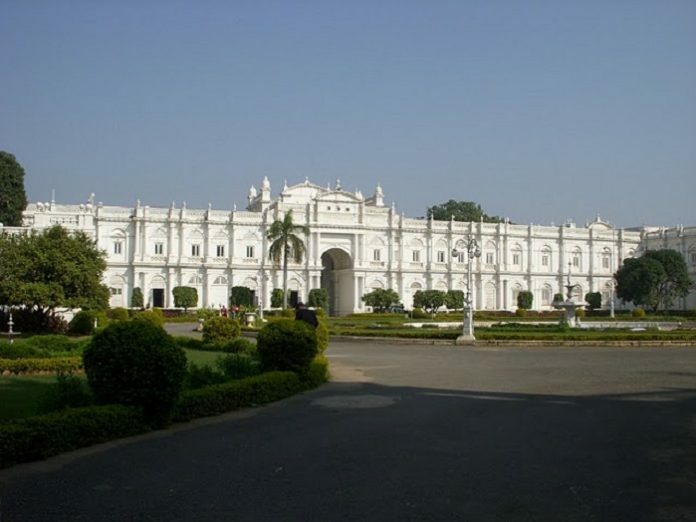 The Ujjayanta Palace in Agartala was once the residence of the royal family of the Kingdom of Tripura. Constructed between 1899 and 1901 by Maharaja Radha Kishore Manikya, it sits beside two serene lakes and is surrounded by lush green Mughal-style gardens. The palace itself is in the neoclassical style and was designed by Sir Alexander Martin of the Martin and Burn Company. 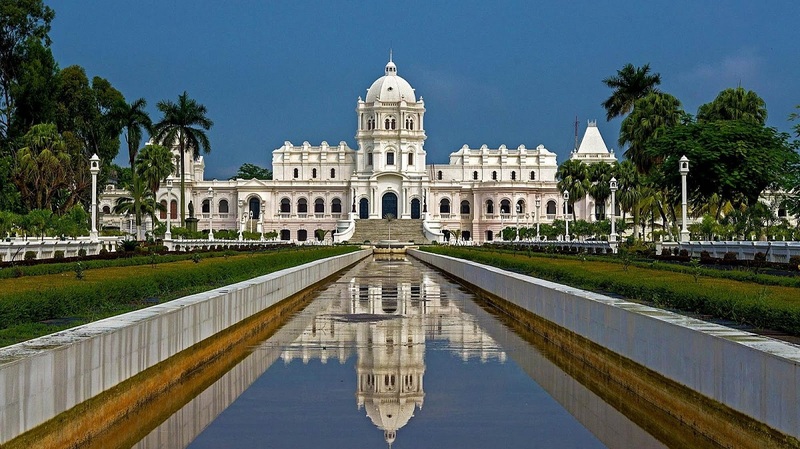 It later housed the State Legislative Assembly of Tripura and is now a museum dedicated to the culture of northeast India. Are there any other famous royal palaces in India that we’ve missed? If so, be sure to share them in the comments below.